There are claims that Jesus never existed or he was just an ordinary Jewish prophet. Yet if the numbers mean anything, Christianity is the world's largest religion, with an estimated 2.2 billion adherents who believe in Jesus (as of 2010). Christians may have different beliefs about Jesus or interpret passages from the Bible differently, but they believe Jesus was the Christ. For thousands of years religious communities have depended on scholars to read, interpret, and analyze faith and the scriptures it is based on. While a theologian makes definitive statements about God based on God’s self-revelations, the scholar sticks to facts. Theology is the study of God. It comes from the word theos which is Greek for “God,” and -ology which is from the Greek word logos meaning “word.” The theologian seeks to persuade people to his interpretation of the Word of God. The scholar seeks to present their evidence-based findings. We need them both. What is echoed throughout the scholarly field of Biblical study is that Jesus was real. Eric Meyers, an archaeologist and emeritus professor in Judaic studies at Duke University said, "I don’t know any mainstream scholar who doubts the historicity of Jesus. The details have been debated for centuries, but no one who is serious doubts that he’s a historical figure.” So they agree there was a Jesus. But who was He? Earlier generations of scholars often separated Jesus from his Judaism. Both scholars and theologians have been changing their view on who Jesus was and what he did by what the archaeologists have been uncovering. What they have begun to recover is more about the real Jesus’s world—life in the fishing villages where he began to preach and choose his disciples. While excavating in et-Tell insights have come from millions of “small finds” gathered over decades of painstaking excavation started in 1987. The archaeologists have uncovered the usual pottery shards and coins, animal bones, and other small items such as pieces of glass and fish hooks, but they also have uncovered structures and cobbled streets, courtyard houses and other simple structures. They believe they have found Bethsaida. Archaeologists discovered evidence of a Roman temple in et-Tel they believe could have been Bethsaida, which didn't make sense for a Jewish town. But in the year 30, according to Josephus, Philip, Herod’s son, dedicated Bethsaida to Livia, the wife of the Roman Emperor Augustus who had died the year before. If this area truly was Bethsaida, their ruler Philip, himself a Jew, might had erected a temple to a Roman goddess in their very midst. Another area near et-Tel contending for the city called el-Araj they have discovered a Roman-era (first- to third-century A.D.) bathhouse which has a mosaic floor, roof tiles, and vents. Archaeologists also uncovered what they believe may be evidence of a church from around the fifth-century with walls and gilded-glass mosaics. The mosaics like they found would only appear in ornate, important churches. At nearby Capernaum, a Byzantine ‘martyrium’ church was built over a site traditionally associated with the apostle Peter and where Jesus resided. The Bible suggests Jesus resided in Peter’s house in Matt 8:14-16. Archaeologists discovered evidence beneath the Byzantine church for a Roman-era home, a rather mundane dwelling that was dated to the first century B.C. By about 50 AD, it appears the house was treated differently than other buildings in the town. First, the house’s main room was completely plastered over from floor to ceiling. This would have been highly unusual for that era. Second, during the ensuing centuries the plastered room had been renovated and converted into the central hall of a rudimentary church. Third, the house’s pottery, which had previously been household cooking pots and bowls, now consisted entirely of large storage jars and oil lamps. During the pilgrimage of Egeria to the Holy Land in the early 380s, she wrote that “in Capernaum the house of the prince of the Apostles [Peter] has been turned into a church, leaving its original walls however quite unchanged. It is where the Lord healed the paralytic. There is also the synagogue where the Lord cured a man possessed by the devil." All the changes to this house pointed to the fact that it no longer functioned as a residence, but became a place for communal gatherings, maybe even the first Christian gatherings. There were other details that helped come to this conclusion. For instance, the excavators found that the room’s old stone walls were buttressed by a newly built two-story arch. This arch supported a new stone roof. The room was painted over with floral and geometric designs of various colors. Over the centuries more than a hundred graffiti were etched onto its walls. The scratched inscriptions were written in Greek, Syriac or Hebrew saying things like “Lord Jesus Christ help thy servant” or “Christ have mercy.” Some are accompanied by etchings of small crosses or, in one case, a boat. Peter's name is mentioned in several of the graffiti. This simple church building survived for more than 300 years before it was finally replaced in the fifth century by a well-built octagonal martyrium church. Octagonal martyria were built to commemorate an important site. The inner sanctum of the octagonal building was built directly above the remains of the very room of the first-century house that had formed the central hall of the earlier church. Other finds found in Capernaum was a jetty that was constructed to prevent water from flooding the town and to form a harbor for boats, as can be seen by the protrusion of stone walls going out over 75 feet into the water to form a pier, and the remains of a 1st century AD black basalt synagogue, making it one of the oldest synagogues currently known. The benches that were discovered along the walls were made of a beautiful white Ashlar stone and the large foundation pillars were expensive to build. This synagogue was primarily dated based on the 1st century AD pottery found underneath the cobblestone floor to the time of Jesus and the Apostles. When Jesus lets out his "woes" against some cities, Bethsaida is one of them. He said, "Woe unto thee, Chorazin! woe unto thee, Bethsaida! for if the mighty works, which were done in you, had been done in Tyre and Sidon, they would have repented long ago in sackcloth and ashes" (Matt. 11:21). It could be that accommodating these pagan overlords may explain why Jesus damns the place. And then in the end, the better part of the Jews did not repent, nor in the other cities Jesus mentions. 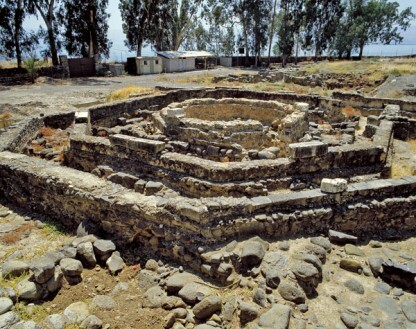 Ten miles southwest, and two hours (north) from Capernaum is the town of Magdala. Magdala is believed to be the hometown of Mary Magdalene. Archaeologists were doing a routine check before allowing building there when they found a stone wall. As they kept digging they realized they had uncovered a synagogue, the first uncovered believed from Jesus' time. There were stone benches alone the walls, enough to seat 200 people. It had a mosaic floor and was full of other beautiful mosaics and frescoes. There were separate chambers for public Torah readings, a private study and storage for the scrolls and a bowl outside for the ritual washing of hands. 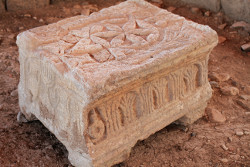 In the synagogue, archaeologists discovered In the center of the sanctuary a mysterious stone block, the size of a toy chest, unlike anything anyone had seen before. They called it the "Magdala Stone," considered by many experts to be one of the most important discoveries in biblical archaeology in decades. Carved onto its faces were a seven-branched menorah, a chariot of fire and a hoard of symbols associated with the most hallowed precincts of the Jerusalem temple. What has surprised many theologians is how Jewish Jesus and those around him were. Some scholars have held the belief that Jesus taught not just to the Jews but to the gentiles. The finds have proved otherwise. Archaeology has shown that the people closest to Jesus were very Jewish. Judging by the remains of the bone fragments the archaeologists have uncovered, the Galileans didn’t eat pig. The limestone jugs found stored liquids in vessels that complied with the strictest Jewish purity laws. There were no graven images on the coins, keeping with the Second Commandment against graven images. In the Gospel of Matthew Jesus directs his disciples "saying, Go not into the way of the Gentiles, and into any city of the Samaritans enter ye not" (Matt. 10:5). In another story as told in Matthew 15:21-28, Jesus also reiterates that he goes to the lost sheep first. The story has also another lesson with a Canaanite woman who is outside the House of Israel. Jesus had travel to the district of Tyre and Sidon. A Canaanite woman begs Jesus to heal her possessed daughter. Jesus appears to ignore her and the disciples ask Him to send her away. Jesus answered "I was sent only to the lost sheep of the house of Israel.” The woman does not give up. She kneels before Jesus and he tells her, “It is not meet to take the children’s bread and cast it to the dogs", which seems a pretty direct statement comparing her to a dog. Jesus was really saying it is not appropriate to take the light and power of God and use it to help rid people of their problems when they have no interest in the source, God. In the Gospel of Mark the story appears also, but in slightly different detail which gives another viewpoint. Jesus is is approached by the woman and then later she follows him still entreating him for help. The disciples want to get rid of her and are really asking the Lord to do as she asks so she will go away. Jesus rather is not ignoring her because he does not care. It is like when we pray God does not always answer right away. Our faith is tested. Such was it for this woman. The woman agrees with the Lord's statement that she does not deserve this healing for her daughter, but then she cleverly answers that even the dogs will eat of the crumbs that fall from their master's table. She is imploring upon Jesus' mercy to heal her daughter and so Jesus does bestow His mercy upon them. And this is what Jesus finally answers to her. " O woman, great is thy faith: be it unto thee even as thou wilt." The ancient texts known as the Dead Sea Scrolls are considered one of the greatest archaeological finds of the 20th century, yet to this day they remain shrouded in mystery and controversy. The Dead Sea Scrolls were discovered in eleven caves along the northwest shore of the Dead Sea between the years 1947 and 1956. Scholars have identified the remains of about 825 to 870 separate scrolls. The Scrolls are divided into two categories—biblical and non-biblical. Fragments of every book of the Hebrew canon (Old Testament) have been discovered except for the book of Esther, all of them created nearly one thousand years earlier than any previously known biblical manuscripts. The Scrolls are for the most part, written in Hebrew, but there are many written in Aramaic, the common language of the Jews of Palestine around the last two centuries B.C. up to the first two centuries A.D. They also contain previously unknown stories about biblical figures such as Enoch, Abraham, and Noah. A quarter of these non-biblical manuscripts are labeled “sectarian,” and are composed of material that seems to reflect the life and philosophy of a specific community. The term "Pseudepigrapha" was used for some of these works, such as the book of Jubilees which was known in Ethiopic and Greek versions before being found in Hebrew in the Qumran caves. There are also exegetical texts, hymns and prayers, wisdom texts, apocalyptic texts, and calendrical texts, all from the Second Temple period. The scrolls also set forth a series of detailed regulations that challenge the religious laws practiced by the priests in Jerusalem and espoused by other Jewish sects such as the Pharisees. Consequently, scholars of Judaism consider the scrolls to be a missing link between the period when religious laws were passed down orally and the Rabbinic era. From uncovering the remains of primary Jewish towns the question arises in how diverse the simple Jews were in comparison to the well-known Pharisees, Sadducees and the Essenes? We hear a series of such complaints about the priests, many of the them in the Dead Sea Scrolls, many of them found in Rabbinic literature, and some from going back to the prophet. Many Jews were unhappy with the way the priests ran the temple. Maybe they did not follow the purity laws perform the sacrifices properly. Maybe the priests themselves were insufficiently pious, or used their offices for self-aggrandizement, or making themselves wealthier at the expense of the community, as Jesus pointed out in Matthew 23. But woe unto you, scribes and Pharisees, hypocrites! for ye shut up the kingdom of heaven against men: for ye neither go in yourselves, neither suffer ye them that are entering to go in. Woe unto you, scribes and Pharisees, hypocrites! for ye devour widows' houses, and for a pretence make long prayer: therefore ye shall receive the greater damnation. Woe unto you, scribes and Pharisees, hypocrites! for ye compass sea and land to make one proselyte, and when he is made, ye make him twofold more the child of hell than yourselves. Woe unto you, ye blind guides, which say, Whosoever shall swear by the temple, it is nothing; but whosoever shall swear by the gold of the temple, he is a debtor! John the Baptist came to minister to the nation of Israel to prepare them for their Messiah. When Jesus began His ministry, it was only to the people of Israel. We see the progression of His ministry throughout the New Testament. After Jesus' baptism He has the experience with Satan where He is shown the kingdoms of the world that could be His. Jesus was not interested in taking over the world kingdoms His purpose in coming was to establish the Kingdom of God, but He knows it starts with the rebellious people of Israel. In the Old Testament period, God chose Israel to be a minister to the Gentiles, but what did Israel do again and again? They copied the idolatrous ways of the Gentiles instead and thereby they were chastened over and over again. "For whom the Lord loveth he chasteneth, and scourgeth every son whom he receiveth. If ye endure chastening, God dealeth with you as with sons; for what son is he whom the father chasteneth not? (Heb. 12:6-7). Israel was to be the catalyst through which God would accomplish his promises to the world. The long-awaited Messiah comes as the fulfillment to Israel’s vocation, that is to say that the Lord chose Israel to be the first among all nations to lead all nations back to Him. In other words, Israel is called to be the first to turn back to God. Jesus accomplishes the mission of Israel through his own life and work, thereby bringing the blessing of Abraham to the nations, as was promised in the Old Testament. Perhaps one day archaeologists may uncover more connected to the historical Jesus and his mission throughout Galilee. Yet there is enough proof already to allay any skeptic's discounting of the real Jesus.